The yoga-lover has some tips for staying fresh on the go. We’ve seen Bravo TV’s Real Housewives of Dallas, Cary Deuber, contort her body with ease on national television during a yoga class. She is notorious for her headstands, toned physique, and affinity for yoga. 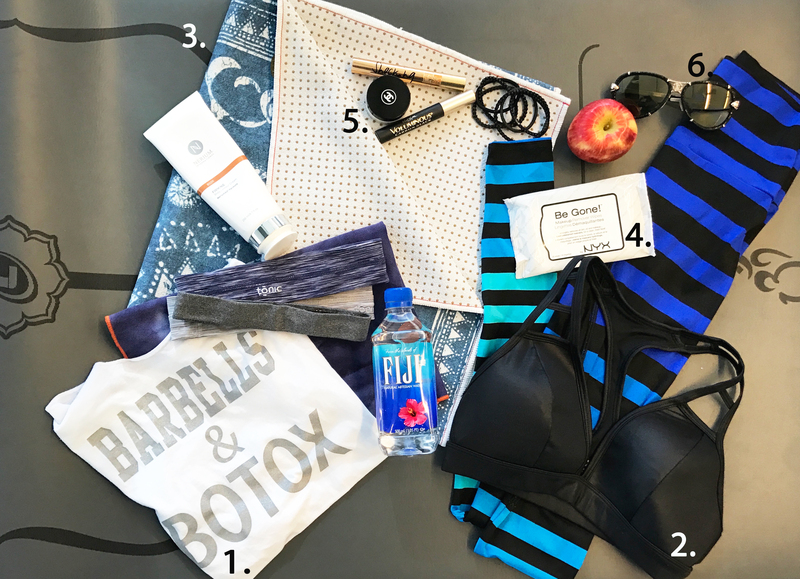 Determined to find any tips or tricks we could snag to mimic her flexibility and figure, we took a look in her gym bag. Here, we share some of the goods. This was actually a gift from one of my friends who owns the line Gym Glam Apparel. 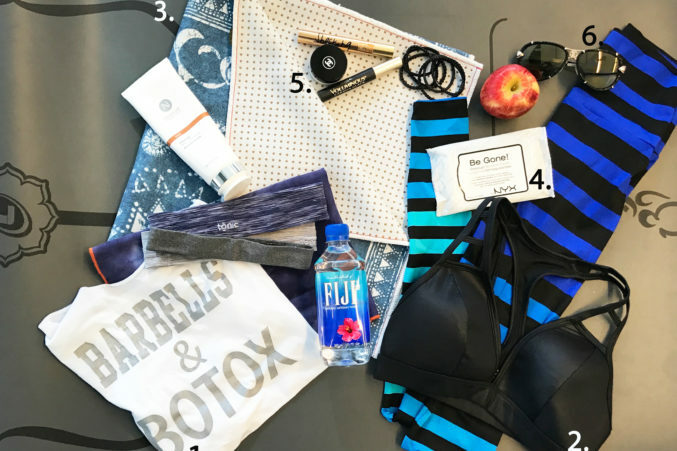 I love fun tanks like this because it combines my love for fitness with botox and injectables, which is a big part of what I do every day. As a CRNFA, I not only assist in surgeries with my husband (plastic surgeon Dr. Mark Deuber), but I also handle all of our entire injectables (fillers, plumpers, you name it!). Now, people often think that anti-aging is all about product and plastics, but a huge part of looking good is feeling good and staying fit. True anti-aging and positive body image starts from inside—that’s why I’m at the gym! This bra is one of my favorite pieces from my go-to yoga line, Alo Yoga. I love pieces like this that bring a little style to a day of working out. Statement straps and cutouts like these help get me a little more excited about getting out of the house for a workout. I love this yoga mat! Definitely my favorite one so far from Liforme. The company focuses on being eco-friendly, ethically and socially conscious, and the products are actually designed for yogis by yogis. This mat contains alignment markers to intelligently guide yogis of all shapes and sizes to help practice in better alignment, which is key. The blanket is especially important for heated yoga where you might sweat a lot. The cool-printed fabric contains little grips on the bottom to lay flat and grip the top of your yoga mat. I practice yoga every day, or I don’t really feel like myself. For me, it’s part of my lifestyle and so much more than a workout because I truly feel aligned and centered as a result. For about 15 years, I’ve make time to get in my yoga daily, usually in the morning before starting my day at the office. I even got my husband, Mark, to start going with me! A good package of face wipes is a gym bag essential if you’re someone who is constantly on the go. I need to keep my face clean and refreshed after any good workout to keep my skin clear of any oils or makeup remnants that can cause breakouts. Plus, it’s a great refresher if you don’t have time to go straight home after the gym. You have no idea how many times I’ve used these in the car on my way to pick up kids, groceries, etc. I really try to avoid makeup during a workout. I wash my face every night, so I’m always pretty fresh-faced for yoga. But if I have to go straight into work or run errands after the gym, I always keep my Chanel lipstick with me and my favorite mascara just in case I have to have a glam sesh in the car. These Roberto Cavalli sunglasses are definitely my favorite. I keep them in my bag no matter what so that I can just throw them on while leaving the gym (especially if I skipped that car glam sesh!). Also pictured: K-Deer Alexis Stripe Leggings (brand sold at Dallas’ Bandier as well) and Tonic Active headbands.